A 200 yard round for a shotgun, capable of dispatching big game where they stand with extreme effectiveness, this saboted slug weighs in at 385 grains a uses some of the most extreme engineering in the world for a shotgun projectile. 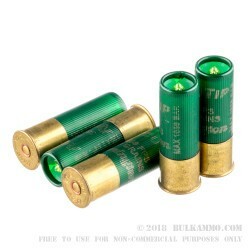 It equates to a shell capable of making your hunting trip a great result every time. 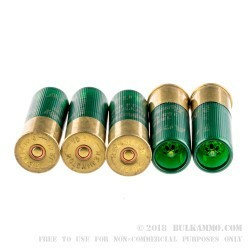 Note: this shotgun shell must be used ONLY in a rifled barrel. The “extreme” engineering of this slug is actually quite innovative with a set of channels in the cone of the projectile to aid it in flight and ensure long range flight stability. This same aerodynamic engineering helps to ensure high weight retention, concentric mushrooming and hard hitting, bone-crushing penetration. The high weight and the copper jacket aid in the beneficial effects of lower fouling and wound channel. 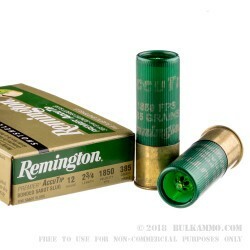 Despite a significant price tag associated with the rounds, these enjoy a very good reputation across the board with shotgunners who hunt big game. The ability to consistently take massive animals at more than 150 yards is quite a statement of potential to shotgun hunters everywhere. The 1850 fps velocity and 385 grains of stopping power delivers every single time.